I hope the cooler weather is blowing into the east and the rest of the country will get some relief. In the meantime, I wanted to get the post out for these wonderful Grilled Vegetables I served with my Teriyaki Marinated Steak on Friday. Grilled veggies are such a perfect side for so many summer recipes, but I wanted these to have just a bit of an Asian flair to go with the Teriyaki Marinated Steak. So I got a little crazy. I raided the veggie drawer and pulled out zucchini and squash to grill. And cute little baby tomatoes were drenched in Mirin and olive oil – I knew the vinaigrette they formed would brighten those grilled squash. (I made extra to use as a side in a later meal – they’ll just get better and better as they sit.) 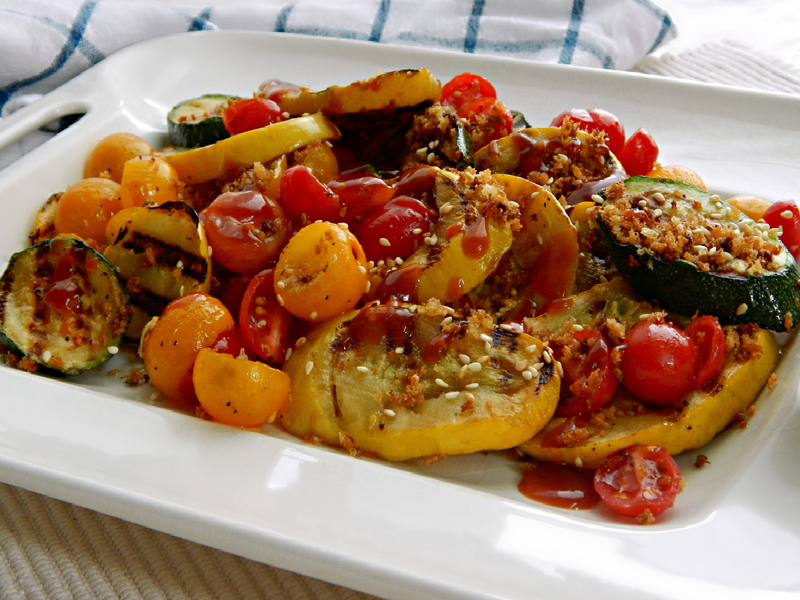 I topped it all with toasted sesame seeds and a few bread crumbs. Then I just got this hair-brained idea. Tonkatsu Sauce. Yep, you heard it right. That sweet umami sauce (it’s kind of like a barbecue sauce with a deep, tangy Worcestershire saucy taste) flung across the smoky grilled veggies. Heaven! Need I say more? Just that a recipe for a quick little Tonkatsu Sauce will be coming, but if you have a store-bought one, that’s fine, too. Look for specials at the store for the tomatoes and let the price guide you on which ones to use. While the grape tomatoes I used today are darling, they can be pricey and frankly, any tomato will work. Just cut into appropriate sized chunks if using a large one and let them drain for a bit before adding the marinade. If you don’t have Mirin, a little rice wine vinegar with a teaspoon or so of Sherry would be an appropriate substitute. While Panko bread crumbs are great in this, home-made bread crumbs are just as good and cost a lot less. Make the marinated tomatoes ahead by at least an hour and up to the day before: Cut tomatoes in half, add to a bowl. Add mirin, the two tablespoons olive oil and salt & pepper to taste. Cover & place in the fridge. Toast sesame seeds in a small pan over medium heat, shaking often, for just a minute or two until they just start to pick up a little color. Remove immediately to a small bowl. Add the two teaspoons olive oil to the warm pan. Add the bread crumbs and toast until golden brown, stirring often. Add to the sesame seeds. Spray zucchini & squash on both sides with cooking spray and grill for a minute or two per side until they’ve picked up some grill marks and are slightly softened. Place in a large bowl. Add the tomato mixture and some of the liquid and toss. Place on a platter, sprinkle with the bread crumb & sesame seed mixture. Drizzle with Tonkatsu sauce and serve slightly warm or at room temperature. Pass additional Tonkatsu sauce on the side, if desired. Note: I used two pints of tomatoes and used the extra as a side salad the next day. I didn’t increase the amount of Mirin or olive oil. And, as I do almost every Friday, I’ll be linking up to Angie’s Fiesta Friday Number 129! Many of my fave bloggers hang out there every weekend and this week’s co=hosts are co-hosts this week are Jhuls @ The Not So Creative Cook and Colleen @ Faith, Hope, Love & Luck. This entry was posted in Click here for Fabulous Food Posts and tagged breadcrumbs, Cherry Tomatoes, Nuts and Seeds, Sesame Seeds, Summer Squash, Tomatoes, Vegetable Side, Zucchini. Bookmark the permalink. I’ve never heard of Tonkatsu either, but now I want to try it! We really haven’t grilled many veggies yet this year. I need to change that while everything is so good and affordable. I’ll have to pick some stuff up this weekend and light up the grill! The older you get the shorter the summers!! I feel like I’m almost in a frenzy to catch each new veggie as it comes in season, lol!! Tonkatsu is really a fun condiment! So glad you’re seeing cooler weather…no luck on that front here! It’s hot, hot, hot! Thanks for sharing this lovely recipe on Fiesta Friday! This looks, sounds and, no doubt, tastes fabulous! Gorgeous photography, too! Well thanks! I keep thinking I’m ready for a big girl camera but now and then I think my little Nikon does a great, if very straightforward job! And it was a delish side; and a great method with so many different types of veg. Your dish looks super tasty, but I have no idea what Tonkatsu sauce is. I’m curious! Hi Winnie – it tastes like a blend of Worcestershire and Barbecue sauce. It’s tasty!! I love that you said “happy!” They were fun to make and to eat, and just as good hot or cold. Thanks, Jhuls!! Thanks, Elaine – they were good – and almost a meal in themselves! What a clever use of tonkatsu sauce! I’ve never thought of using it for anything else, but it tastes so delicious, it would be just wonderful on all sorts of things! I don’t know why I just thought – this needs Tonkatsu, lol, but it was so good with the slight smokiness from the grill. I’ve never heard of Tonkatsu sauce. The veggies look amazing. Glad the heat dome is lifting, it’s getting more intense here and they said it will be in place until Thursday. Oooh, I’m so sorry to hear that! We were 98 early afternoon yesterday and I didn’t even hear what the high was, and now mid 80’s feels like relief! Normally I’d be griping about 80’s, lol!